With Christmas around the corner, college students want to enjoy the holiday with friends and family while off from school. 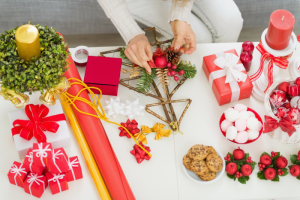 Even while living on a limited college budget, there are still ways to make the holiday season more personable and entertaining. A great gift for the mothers, sisters, friends and girlfriends who enjoy pampering themselves. Just place a quarter cup of coconut oil into a microwave safe bowl and microwave it for one minute, or until it’s liquid. Add one cup of sugar into the bowl and mix together well. Then squeeze 10 or so drops of essential oils and food coloring into the bowl, mixing completely. Finally, put the scrub in the mason far and tie it with a pretty bow to bring it together. Who doesn’t like sipping hot chocolate, cuddled up in blankets on a snowy night? The gift is quick, cheap and a great idea for friends. After gathering all the ingredients, all that’s left is to put everything in the mason jar in this order: hot chocolate powder, chocolate chips, marshmallows and crushed up candy canes if you’d like. Now you have ready to make hot chocolate for any time you want it. There is no shame in not making christmas cookies or gingerbread houses from scratch. There are packets of dough cookies already prepared that taste similar to the other cookies. All you have to do is add butter, water, and an egg. It’s the same with gingerbread houses. Kits are less time consuming and usually less expensive, unless you’re buying extra candy. Without the hassle of measuring everything properly, there’s more quality time spent in making the holiday goodies, but most importantly eating them. Anything can be made into an ornament. Maybe you’re into sewing and want to use felt and stuffing to make some soft, cute ornaments. If glitter is more your style, pick up clear ornaments that you can put all different types of decorations inside, or you want to make it simple and just write the year on a ceramic ornament with bold colors. The fun is making those ornaments and hanging them on the tree for a keepsake.